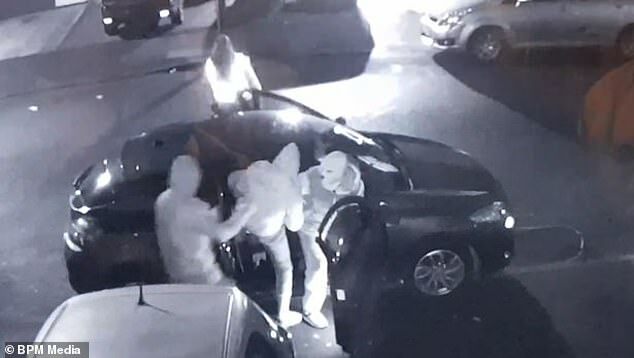 This is the chilling moment a gang of thugs stormed a house and threatened to kill a heavily pregnant woman with a machete. The hooded men raided the property in Sparkhill, Birmingham, while the eight-month pregnant woman, her aunt and two young children were inside. They threw the weapon on the kitchen worktop and demanded gold and cash before threatening to kill the expectant mother. CCTV from the attempted robbery then captured the gang dashing into a car and flee the house empty-handed. The expectant mother's father said: 'They are lower than low. 'They have got sisters and mothers - what if someone did that to their mother? The 25-year-old was at the Bromyard Road home with her two-year-old son, her 41-year-old aunt and her nine-year-old daughter when the doorbell rang just after 8.30pm on Friday. She opened the door thinking it was her teenage brother who had just gone to the shop to buy naan bread. The father said: 'Four guys came in with a machete. They demanded gold and money. 'They said "We've had information that you have gold in the house." 'The one with a machete stayed in the kitchen holding my daughter's wrist really tight asking her to tell them where the money was. The victim kept calm for the sake of her two-year-old son who was in the living room as the man repeatedly hit the machete on the work surface and threatened to kill her. A man in a hi-vis jacket then ran upstairs to check the bedrooms but returned empty-handed. The woman's father said: 'My sister took her rings off her hand and said "take this" but they said they said "we want more." After a while the men said 'lets dip' - slang for leave - and are said to have fled in a Renault Megane. Cops arrived within minutes and an investigation is underway. A spokeswoman from West Midlands Police said: 'Police are investigating an attempted robbery after four men entered a house on Bromyard Road in Sparkhill just after 8.30pm on Friday. 'It is believed one of the men was armed with a knife and made threats as the others searched the upstairs part of the property. Birmingham saw 702 robberies in September this year, an increase from 571 in the same month last year. The city has also seen a staggering increase in the number of recorded crimes in total - suffering 24,548 in the month this year as opposed to 23,208 in 2017. Birmingham, which is Britain's second biggest city, has also now seen gun crime rates rise above those of the capital. There have already been more than 33 homicides in the city this year alone, with over 25 gun crimes per 100,000 people, higher than in London.